U. ILLINOIS (US) — A new stain-free method for reading biopsies promises faster and less subjective cancer detection. The century-old process of staining biological tissue for examination under a microscope remains the standard assessment tool for pathologists looking for signs of cancer. 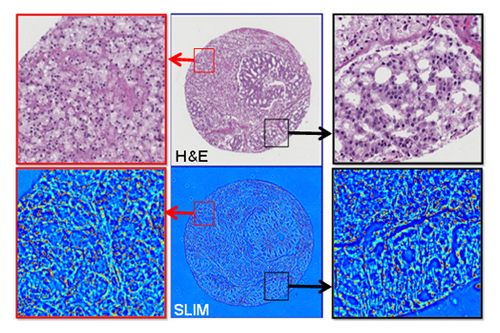 The new technique provides images that rival or surpass those from histological staining. In addition, the technique is automated, and it provides quantitative data on structures at the cellular level. Researchers from the Beckman Institute at the University of Illinois, Christie Clinic in Urbana, Illinois, and the University of Illinois at Chicago report using the method for cancer detection in a paper for the Journal of Biomedical Optics. The method, Spatial Light Interference Microscopy (SLIM), employs phase contrast microscopy and holography that combine multiple light waves to enable visualization of nanoscale structures quantitatively and without staining. Using the SLIM method to examine more than 1,200 biopsies, the researchers were able to visualize unstained, or label-free, cells with high-resolution, high-contrast images. The results demonstrated, they write, “that quantitative phase imaging of entire unstained biopsies has the potential to fulfill this requirement. “Our data indicates that the refractive index distribution of histopathology slides, which contains information about the molecular scale organization of tissue, reveals prostate tumors and breast calcifications. These optical maps report on subtle, nanoscale morphological properties of tissues and cells that cannot be recovered by common stains, including hematoxylin and eosin. Study leader Gabriel Popescu says that the SLIM’s interferometric (which measures phase differences in the light path) capability is what makes it work with a great sensitivity, down to the molecular scale. And that capability is why SLIM can be so valuable for greatly improving the chances of early detection and treatment of cancer. “What that means is that only a small number of molecules arranged in a certain way are enough to give us the optical signal that something is going to happen here,” he says. “We think that the most important advantage of SLIM is that it provides quantitative, objective information,” says Popescu, a faculty member in the department of electrical and computer engineering. “Right now, in the clinic, the diagnosis is subjective; it’s a human that does it. There are studies showing that two pathologists agree on a diagnosis only four out of five times. “The holy grail of the research will be to actually predict information about the outcome of the patient,” Popescu says. “So for those that undergo surgery, what are the chances that the cancer will reoccur? This, right now, is actually a 50/50 guess. Popescu was joined in the project by collaborators at the Quantitative Light Imaging Laboratory, University of Illinois, and the University of Illinois at Chicago.